Back to School is here and with it brings new routines, new challenges and new opportunities. For parents, it can almost feel like a second New Year’s filled with resolutions on how to be more productive, more mindful, and more present in our lives. 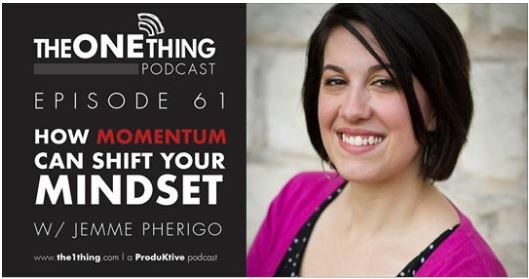 If you’re looking for inspiration to tackle a fresh start this Fall, you’ll love the latest episode of The One Thing podcast with our very own, Jemme Pherigo. She gives her tips on how to take small steps that lead to big changes in your quality of life. Over the span of two years, she has given up soda, lost 26 lbs, said goodbye to toxic relationships, started the habit of early rising, and stopped smoking. Find out how she did it, here.